" Please note that a Summer/Fall hair course will not be offered this year. "Overall excellent course and I feel very, very lucky to have been part. Everything was exceptionally organized and it was thoughtfully put together. Thank you.."
I feel very lucky having the chance participating in this course. Absolutely amazing." "I feel extremely comfortable treating very complex hair loss patients and prescribing immunosuppressant medications"
"What I liked best were the clinical sessions and discussions about the individual patients as well as the hair transplant procedure observations"
"The learning in this course has significantly exceeded all my expectations..."
"The course was very well organized in all aspects." "Important points to remember were emphasized which was perfect!" "Dr Donovan made learning about hair disorders and treatment interesting and simple"
"Intensive week but you don't want to miss anything that he says because they are "must knows"
"We were allowed to ask any question and the answers were on point"
"We had exposure to different procedures, real patients and learned first hand how Dr Donovan manages patients in the clinic"
"Dr. Donovan is so thorough and good at distilling complicated subjects into useful and applicable information"
"It was an amazing experience for me and I will recommend it for sure"
Excellent teaching and exposure to patients and hair loss treatment techniques. Dr Donovan is an extremely knowledgable clinician/teacher providing an extremely enjoyable and informative course. Highly recommended to fellow physicians!! "I really liked everything - I enjoyed the lectures, PRP and hair transplantation. I think we had 5 productive days." "The experience in learning hair transplant surgery and PRP exceeded my expectations and now I'm very comfortable with counselling patients about doing them and all the options the course presented me." "The lectures were really stimulating and clear, especially because we could discuss a lot about them"
"I was made to feel very comfortable to ask questions"
"I really like this hair loss course. This course is very useful for every doctor that wants to learn more about hair loss and hair transplantation ... I'm so glad that I joined this course." "I very much appreciate this course." "The course is simply amazing." "I had an excellent time in the Hair Course." I am more confident in diagnosing and counselling patients with hair loss. The course is valuable"
Our Course - Why was it created? 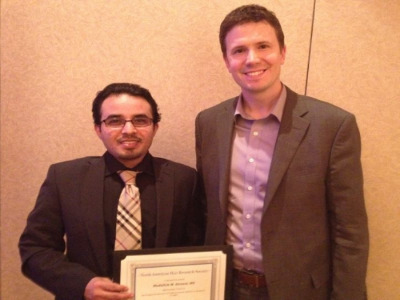 Dermatologist and 2013 North American Hair Research Society (NAHRS) Mentorship Recipient Dr. Al-Enazi (Saudi Arabia) with Dr. Donovan at 2013 AAD meeting in Miami, USA. Dr. Al-Enazi trained with Dr. Donovan for 10 months in Toronto. Since 2010, Dr. Donovan has trained physicians from over 25 countries. It is increasingly apparent that there are only a limited number of opportunities world-wide for physicians to gain concentrated exposure to all the various complex forms of non-scarring hair loss (AGA, early onset AGA, AGA associated with PCOS, alopecia areata, trichotillomania, chronic TE, drug induced TE) and scarring hair loss (LPP, FFA, PPB, CCCA, discoid LE, dissecting cellulitis, folliculitis decalvans, acne keloidalis) and to review treatment. It may take many months for physicians to be exposed to and learn about all of these conditions. The Hair Course provides an opportunity for physicians to explore these questions - in a concentrated and efficient manner and to gain exposure to modern methods of hair transplant surgery. How does one properly diagnose these conditions? What work up is needed? What blood tests? When is a biopsy needed? What are the appropriate treatments? What is the scientific evidence behind their recommendation? How do we properly diagnose and treat hair loss in those with Afro-textured hair? When is hair transplant a good option for hair loss ? When is it not? The goal of the week-long course is to provide physicians and trainees with concentrated exposure to a variety of commonly encountered and complex hair loss conditions. The course will provide a mixture of didactic lectures, clinics, rounds, readings and workshops. Physicians work closely with Dr. Donovan learning about all aspects of hair loss. Participants will have the opportunity to participate in 6 hair loss clinics under supervision and to observe 2 hair transplant procedures. Time spent in the 6 half day hair clinics will expose participants to dozens of challenging diagnoses with time to explore diagnosis, differential diagnoses and appropriate first, second and third-line treatments. Time in the surgical centre will enable participants to better understand the procedural options for treating hair loss including follicular unit hair transplantation and platelet rich plasma. An array of lectures and workshops throughout the week provides an additional means of developing and solidifying knowledge. ** please note that a course will NOT be offered in 2017. A link to the online "Quiz 1" will be emailed at the end of the day and participants can complete the interactive session online. Answers are provided immediately following completion of the quiz. It is not a ‘test’ but rather a means to help solidify knowledge, review key points and introduce concepts that may not have been introduced fully or at all during the day. A link to the online "Quiz 2" will be emailed at the end of the day and participants can complete the interactive session online. Answers are provided immediately following completion of the quiz. It is not a ‘test’ but rather a means to help solidify knowledge, review key points and introduce concepts that may not have been introduced fully or at all during the day. A link to the online "Quiz 3" will be emailed at the end of the day and participants can complete the interactive session online. Answers are provided immediately following completion of the quiz. It is not a ‘test’ but rather a means to help solidify knowledge, review key points and introduce concepts that may not have been introduced fully or at all during the day. A link to the online "Quiz 4" will be emailed at the end of the day and participants can complete the interactive session online. Answers are provided immediately following completion of the quiz. It is not a ‘test’ but rather a means to help solidify knowledge, review key points and introduce concepts that may not have been introduced fully or at all during the day. WHY WAS THE COURSE CREATED? Although hair loss is common, concentrated exposure to hair loss problems during physician residency training and/or fellowship training may not be available in all training programs. The course was created to provide concentrated exposure and teaching in all areas of hair loss medicine. It is an intensive 5 day course with 10 hour days with further review and self-study expected of participants in the evenings. WHAT IS A TYPICAL DAY LIKE ? Each day is slightly different. Monday, Wednesday and Thursday of the Hair Week are “hair clinic” days and start with either a didactic lecture or patient viewing rounds. The mornings and afternoons are spent in clinic evaluating patients with a wide variety of scarring and non-scarring hair loss problems. A series of lectures are presented during morning , mid-day (lunch) and afternoon. Tuesday and Friday are “surgical” days with opportunities to observe and discuss hair restoration surgery. A full schedule of the week can be found above. WHAT ARE THE ASSOCIATED COURSE FEES? Yes. Expenses related to travel and accommodation are the responsibility of each attendee. ARE ATTENDEES ABLE TO PARTIPIPATE IN HAIR LOSS RESEARCH? Given the intense nature of the schedule for the week, opportunities to participate in hair loss research are generally not available during the 5 day course. IS IT POSSIBLE TO ARRANGE AN EXTENDED VISIT OR PURSUE AND LONGER FELLOWSHIP? At the present time, attendance in the hair course is limited to one week. Opportunities for extended visits in the hair clinic, clinical hair fellowships or research fellowships with Dr. Donovan are not currently available. We are not accepting applications at present. AM I ABLE TO HAVE "HANDS ON" EXPOSURE DURING SURGERY? The strict legal requirements in Canada do not allow participants to perform surgery. However, the course is designed to provide very concentrated exposure and learning in hair transplantation.